Nguyen Trung Cap, a doctor of the National Hospital of Tropical Diseases in Hanoi, said there had three pregnant women suffered from a rare pneumonia. The pregnant patients from the northern locals of Hanoi, Hai Duong and Hai Phong have been taken to the hospital in serious conditions, breathing failure, damaged lung and low blood pressure. They must use breathing machines. Doctors couldn’t find out the cause despite conducting many tests. Doctors have quarantined three patients and provided intensive treatment. Their efforts have been rewarded when three patients have been in stable condition. Moreover, 22 year old Nguyen Thi My Linh who had 34 week pregnant gave birth of a baby weighing 1.7kg. The baby is being raised in a neonatal intensive care unit at the National Children Hospital. 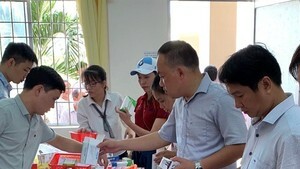 Meantime, hospitals in Hanoi have received a large quantity of patients suffering viral fever. In some cases all family members have the illness. Around 2,000 toddlers see doctors at the National Children Hospital daily, an increase of 700 from the number on previous days. Hospitals Saint Paul, Bach Mai, Army no.103 have also seen a soar of patients recently. Nguyen Hong Ha, deputy head of the National Hospital of Tropical Diseases said the hospital had seen admission of some patients who had contracted the streptococcus, commonly found in pigs, due to having eaten undercooked pork products made from diseased swine. So far 22 cases have been rushed to the hospital. Medical experts warned the increase of rare diseases due to sweltering weather and polluted environment. Parents should take children to medical facilities as flu H5N1, H1N1, dengue fever and meningitis have the same symptoms.